We have one zucchini plant that is producing like crazy already. I am looking for and trying out many new recipes for zucchini and sharing the crop as well! 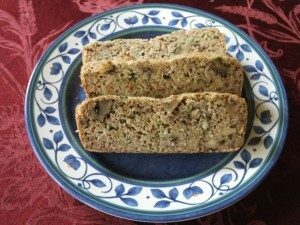 This was really delicious and I will make and freeze some loaves for winter and potlucks. In a small bowl stir together the dry ingredients. In another bowl use a fork to beat together the wet ingredients until well blended. Mix dry and wet ingredients together. Stir in the zucchini, then the walnuts (you could also use raisins). Spread in the pan and bake 40 to 45 minutes until the center is set. Remove from pan immediately and let cool completely before slicing with a serrated knife. Freezes well. Enjoy!